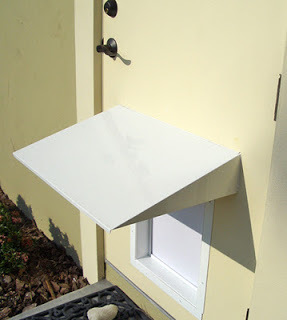 Most pet door manufacturers have taken precautions to ensure regular rain won’t enter a house through the pet door. As long as the flaps or panels close quickly to a tight fit, it shouldn’t be a problem. When weather is a concern, we always recommend choosing a high quality door. The PlexiDor for instance has a high quality weather seal around the panels and closes both quickly and tightly to ensure all sorts of weather stays outside. In areas with regular downpours, an awning might be a worthwhile investment. As a bonus, the awning also provides shade on hot days. During extreme weather conditions such as floods and hurricanes, the pet door should be locked and secured. If the door has a security plate, screw it on.